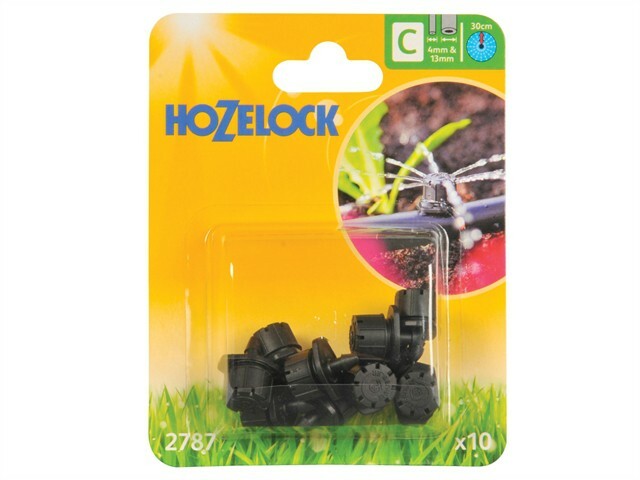 The Hozelock 2787 Adjustable Line Sprinklers are made from tough UV stable plastic. They are designed for end of line use, and enable adjustable flow rate from 0-40 litres per hour. Simply twist the cap to adjust. The mini sprinklers can be dismantled for cleaning. They are ideal for hanging baskets, troughs, round containers, borders, greenhouses, cloches and vegetable gardens. Use at the base of small plants and secure with a stake. Suitable for 4mm and 13mm tubes. Radius of water coverage: 30cm.